A London-based product and furniture designer Imogen Hedges has come up with an un-knitting machine that relies on human power alone to unravel sweaters. 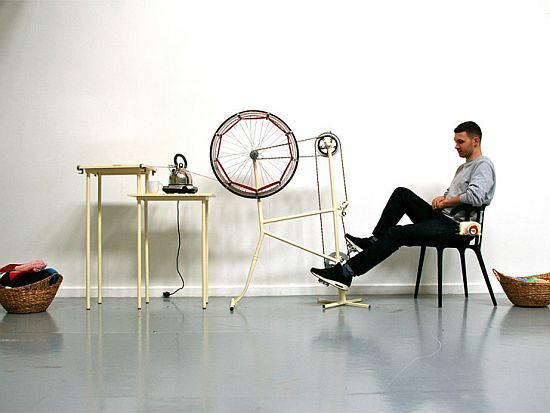 The bicycle-inspired machine helps users recycle unwanted woolen clothes with extreme ease. Hailed as one of the best student design projects of 2012 at the National Center for Craft and Design’s Celebrating the Class of 2012 exhibition, the Kingston University student’s pedal-powered machine is built around an old bicycle frame. The un-knitter needs to sit on a chair and pedal to allow the wool to pass through steam coming out of a kettle. Wool, when passed through steam, softens and then, can be collected on a spindle. My grandmother spent a lot of time knitting sweaters but my mum threw them all away once we’d outgrown them because she didn’t think anyone would want them. With my machine you’d be able to take them apart and knit something new. Undeniably, it’s a commendable project and has the potential of making the tiring job of unraveling sweaters a bit easier than it was ever before.